We had a wonderful Halloween. The weather here in Utah was beautiful! This was the first year that I can remember that it was warm and no jackets needed. We have had a few Halloweens with snow! I sure enjoyed going from house to house with my boys. We love where we live. Our neighborhood had a witch that was brewing root beer, a neighbor making cotton candy, and houses that were giving out pop and king size candy bars. We had such a great time! I hope you did too! Now lets get to the nitty gritty of this casserole. (Said in my best Nacho Libre voice.) You need to make this casserole immediately for your family. My family said that this was the best casserole that I have made to date! My son even took a bite and begged me not to take a picture of it! I can’t even describe the delicious sauce. It is a creamy alfredo base but with the added fiesta ranch spices it made it absolutely incredible! This entire casserole was perfect. From the creamy fiesta ranch sauce, to the cheese melted on top, to everything in between! Holy cow. You are just going to have to try it out for yourself!! Preheat oven to 350 degrees. Prepare a 9x13 inch baking dish and spray with cooking spray. Set aside. In a medium saucepan add heavy whipping cream and cream cheese. Heat over medium heat stirring until cream cheese has melted. Whisk in grated parmesan cheese. Whisk in fiesta ranch packet. In a large mixing bowl, add drained pasta and sauce. Toss noodles until coated. Add chicken and black beans. Spoon mixture into prepared pan. Top with mozzarella cheese. Bake for 20-25 minutes until heated through and top is bubbly. Add optional toppings. Having your family say that this is the best casserole ever is an awesome compliment and enough for me to put this on the menu for my meat-eating boyfriend this week! Now I am really going to have to try this, since you said it’s the best! 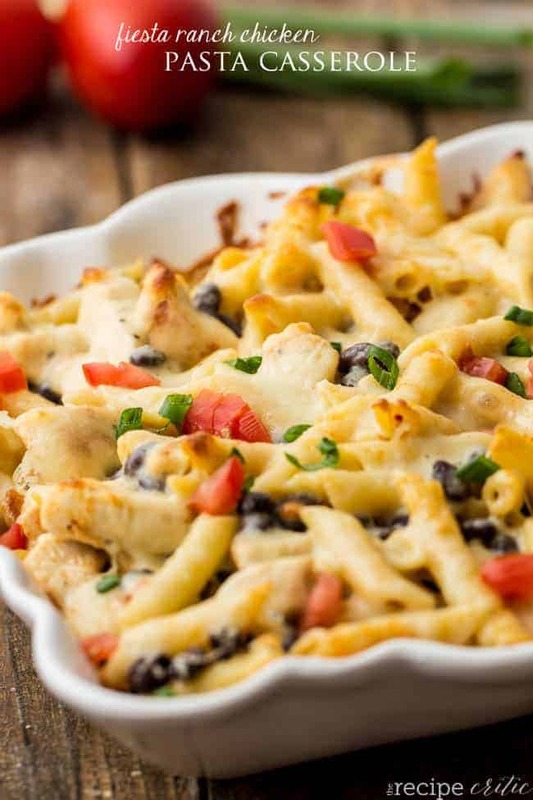 I love casseroles because they are typically so easy to make and are usually delicious. Pinned it to try later! Yum. After that introduction I am definitely going to have to make this for my family! Sounds and looks delicious! Made this last night. Was great. Green Onions and tomatoes should not be optional. The dish was ok without them, but fantastic with them. Love your website. Normal food for normal people, and most importantly that tastes good. What can you use instead of heavy whipping cream? I have all the other ingredients and don’t feel like going to the market. I can’t find the Fiest Dip anywhere in my town or 20 miles out….Do you think a Southwest Chicken Quesadilla Mix would work? It has no Ranch flavor, but hey its the only thing right noW I can find close enough . If you want to you can just leave out the fiesta ranch. It will have more of an alfredo taste but will still be delicious! I assume this can be made the night before and kept in the fridge until oven time? I’d like to make it for a weeknight dinner, but would prefer to prepare in advance, as long as it would keep! I have made this twice and my family loves it!